Mario no Photopi (マリオのふぉとぴー Mario no Fotopī, lit. 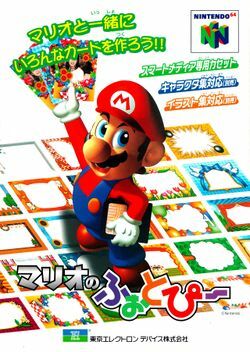 "Mario's Photopi") is a creativity game released for the Nintendo 64 in 1998, in Japan only. The game's cartridge has two slots for SmartMedia cards in the top, allowing for the import of digital photos and other images and for transfer between the cards. The pictures can be edited and decorated with font, artwork from the Mario franchise, borders and other graphics. It is the only game to use the SmartMedia-ready cartridge, which has the model number of NUS-023. SmartMedia cards that were specially made for it in connection with video game themes such as Sylvanian Families, Bomberman and Yoshi were also released. A Goomba as used as an example in photo transitions. This page was last edited on February 13, 2019, at 14:06.